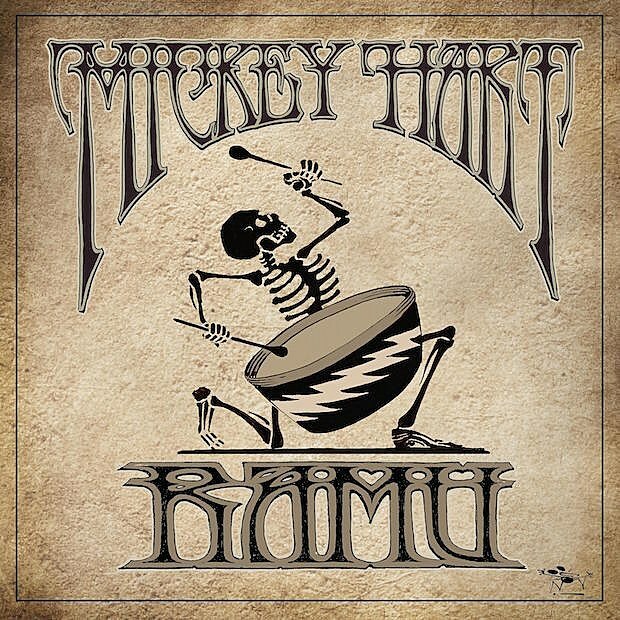 Mickey Hart of the Grateful Dead‘s classic two-drummer lineup (and currently of Dead and Company) is releasing a new solo album, RAMU, on November 10 via Verve Forecast. It follows 2013’s Superorganism. Excitingly, it features Avey Tare of Animal Collective on one of its lead singles, “Wayward Son,” which you can stream below (via Pitchfork). It’s a real student-meeting-mentor moment, as Animal Collective are of course huge Deadheads and they also licensed the first-ever legal Grateful Dead sample for “What Would I Want Sky” in 2009 (it samples “Unbroken Chain”). And it really plays to both of their strengths. It’s a trippy, electronic song with the kind of overlapping drumming that Mickey and Bill Kreutzmann would do in the Dead’s heyday, and Avey Tare’s unmistakable voice sounds as natural here as it does in Animal Collective. The other single is “Big Bad Wolf,” featuring Tarriona “Tank” Ball of Tank and the Bangas (stream that below as well). The album was co-produced by former Pretty Lights member Michal Menert, and it also features recordings by Mickey’s late bandmate Jerry Garcia and by his late collaborator Babatunde Olatunji, as well as unreleased field recordings by Alan Lomax. Dead & Co’s Oteil Burbridge played bass, Dead family member Steve Kimock played guitar, and there’s also Zakir Hussain on tabla, Sikiru Adepoju on talking drum, Giovanni Hidalgo on conga, Charles Lloyd, and The String Cheese Incident’s Jason Hann. Artwork and tracklist below. Meanwhile, Avey Tare recently had to cancel some of his tour dates, but did still manage to play a few, including NYC’s Bowery Ballroom on Monday (10/23) with support from fellow AnCo member Geologist and AnCo’s touring drummer Jeremy Hyman. He still hasn’t rescheduled a full tour, but New Yorkers are lucky because he already added another show here: November 14 at new Bushwick venue Elsewhere (599 Johnson Ave) in the more intimate Zone One room. Tickets are on sale now. All Avey Tare dates are listed below. Avey Tare’s new album Eucalyptus came out earlier this year. It features frequent collaborator Deradoorian, who just so happens to play NYC tonight (10/26). Animal Collective will also be in NYC to perform 2004’s Sung Tongs in full at Pitchfork’s 21st birthday party at Knockdown Center on December 2. That show is now sold out.